It is made from an old horseshoe rasp. It is folded and forge welded together (http://en.wikipedia.org/wiki/Forge_welding) and tapered to fit the handle and stay on. It is almost all sanded to 220 grit with obviously black pitted forge marks. I carved the handle from a large piece of two tone hickory. Can someone explain this to me? Why is the hickory two colors? i have numerous pieces like this. Is it the Phloem and the Xylem of the tree i need bio help! 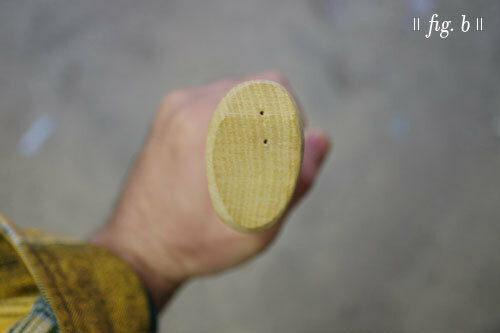 Handle is wiped with linseed oil(Magic Stuff here) a must for all wood projects. It also does a decent job at blade rust prevention. As for throwing it is light for a full grown man but still throws incredible. Probable less then a pound. Questions anyone? let em fly! if there is only one drastic color change, you have a piece that includes both heart and sap wood. The reddish part is heartwood. the whiter parts are sapwood. 2 warnings when using that wood. First, it will dull the gosh darn living heck out of your saw blades. so make sure to keep an eye out, and sharpen or replace them when needed. Second, if you DO have a piece of transitional wood(red PLUS white), SERIOUSLY consider cutting the white portion off. When used in a striking tool(hammer, axe, etc) you will LIKELY split at the transition. Maybe that wasn't clear enough? I'm not saying that IF it splits, it will likely be at the transition(although that is a truth). I am saying you WILL split, and it probably won't be pretty. Why go and use strong, springy hickory for your handles only to have them cleave themselves in twain under normal use? Well i understood majority of what you said, however if it grows slower its weaker....doesnt slow growth result in more strength. I always thought that tighter growth rings meant more strengh? and as a final question are you saying i should go with the heartwood then?and if so why do all commercial hickory handles that i see are made from the white stuff? is it just because it is fast growth? I have no idea about hickory, and what I do know is vaguely remembered from a bow-making tutorial using ash. The recomended wood was not grown too fast, because that is weaker, but not too slow either, because that was (I think) more brittle. Oh and I also remember that hickory handles are best when the rings are the same way as the force...so on a hammer or axe handle, the best would have lines pointing towards the head/blade. Thank you for the input! Do you make your own bows? flamesami got it spot on, with regard to the trade offs. but EVERY hickory bow, if made properly, will be a GOOD bow. Not the best ever, but good. The only exception I know of is, I had a piece of PECAN wood(sometimes sold as hickory) and it was utter garbage as a bow. The wood simply took forever to cure to a usable moisture content, and afterwards, the bow ended up with a too-light draw weight. Ended up donating that one to the high school girl's archery bin, for their gym classes. haha thts quite the tale! nope, I don't have access to decent wood, otherwise I might try it. I remember seeing that 6 rings per inch was about perfect in ash, that hazel was hard to get right (has to be perfect..) I think I got this info from bushcraftUK.com (a forum) where there are a few bowyers?) (bow makers). Oh yeah, did my handle-aglinement bit make sense to you? well, that is right, but possibly not what I meant... if you look down at just the head of your tommahawk, it kind looks like this --o yeah? well if you look at it with the handle in you can see the end-grain. Assuming it isn't from the absolute centre, there should be slightly curvy lines. those line should, as near as possible, line up with the direction of the bit. oh i got it now. Thts y i was confused with y u said it cuz to me the other part was common sense. but i see what you mean now.and did u know u put the same link twice? Speed of growth to strength of wood ratios are determined by species. Oak and pine are great examples. Oak is a MUCH stronger wood if it's fast growth. In fact slow growth oak is downright WEAK. On the other end of the spectrum, old slow growth southern yellow pine is a nice rock hard wood. The "sustainably harvested" stuff you find in stores is grown so quickly, that's it's soft enough to dent with a finger nail. Good for profits, and ecology, OK for wall studs. utter junk for flooring. If you don't know the tree your wood came from, the heartwood is a "best bet" compromise. YES, the commercial hickory handles are of the lighter sapwood because their wood supply comes from fast-growth managed forests. If the industry NEEDED another reason to use the sapwood for handles... They can sell the heartwood as "red hickory" for flooring, where it's denser structure lends to better wear resistance. The side bonus is the color, since 'yellow hickory' is pretty close looking to much cheaper woods in color. Also, IMHO, the heartwood makes a better 'smoke' for smoking, and grilling.